It’s time to order your binding supplies for your comb binder—you’ve got combs in all the common sizes and colors ready to order, and it’s time to replace your comb inserter, so you’ve got that added to your online cart, but you’re forgetting one thing. Know what it is? If you said covers, then you’re absolutely correct! We don’t often think of covers as part of our binding supplies, but what’s the good of binding a bunch of papers together without giving them a solid foundation, a protective layer of durability, and a beautiful finish? Without a cover, your document is unfinished. So in this blog post, we’re going to go through the different cover options that are available and give you some useful information about them. In the end, of course, the choice of whether or not to cover your document is yours, but if you’re needing a little help picking out a cover (and you should be picking out a cover! ), here it is! Clear Acetate Covers are completely see through and are one of the most commonly used cover options. They come in different weights, depending on how sturdy your document needs to be, and in different finishes (we offer a traditional smooth gloss finish, a matte clear finish which reduces glare, and a matte suede finish which has a “pebbled” texture on one side and a non-glare finish on the other side. Clear covers are perfect for letting your company’s logo show, or a full-color detailed design, or photos, like you’d find on menus, photo albums, or catalogs. Clear acetate covers are waterproof, tear resistant, and very sturdy, which will add longevity to any project they’re applied to. Paper Covers are beautiful, professional-looking heavy-weight paper covers used most commonly for reports and proposals. They typically have a small window so that you can add a title page and view it when the cover is closed, although you can also find completely solid paper covers, as well. The covers are usually textured and may have a light coating on them to add durability. Vinyl Covers are similar to paper covers in that they’re textured, solid-colored, and are typically used for reports and proposals, as well as other professional applications. Vinyl covers are usually textured and typically come in conservative colors like black and navy. Vinyl covers have a vinyl cover and a heavy paper backing, so they’re durable and tear-resistant, but not waterproof. They work well for items that may see a lot of use, such as employee handbooks. Polyethelene (Poly) Covers, like clear acetate, are waterproof, tear resistant, and extremely durable. They come in several different textures, including a matte finish and a “leather-look-alike” finish. Like the paper and vinyl covers, Poly covers are not clear—they typically come in conservative colors like black or navy, so don’t really work for items that you may want to see a full-color cover page through. The best part about poly covers is that they can easily be wiped clean if they get dusty or dirty, making them perfect for use in schools, businesses, salespeople, and more. Thermal Utility Covers are for use with thermal binding machines. They come with a clear transparent 10-mil front cover and a thick linen paper back, and the glue is already inserted into the spine, so you simply insert your finished pages and place them in your thermal binder. Thermal covers require you to purchase the specific spine size that you need, so you either need to keep a variety of sizes on hand, or you need to know your project’s spine thickness before you order. These covers give your project a beautiful finish, especially since their’s no visible binding on the spine. Since these covers have a clear front, you can go ahead and use a full-color cover page with them; they’re great for menus, scrapbooks, school projects, portfolios, and catalogs. Cons: more expensive than other cover methods, requires a thermal binding machine, must order size-specific, and not waterproof due to linen paper backing. While often overlooked when considering binding materials, covers are a really great addition to your binding project; they give it a put-together, professional finish and lend durability and protection to it that you just can’t get without a cover. So next time you’re stocking up on coils, combs, or wire—remember to stock up on covers, too! If you’re needing to bind even a fair amount of projects regularly, you’ll want to purchase your own binding machine to reduce costs. If it’s still early in the game and you’re scratching your head about what type of machine you need, you’ll want to head on over to our handy guide Choosing a Binding Method to help you out with that decision. 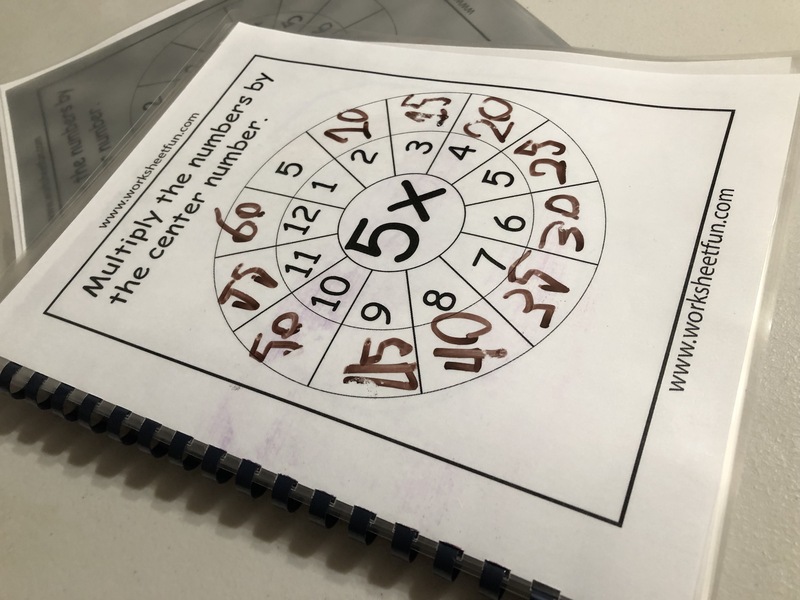 If, however, you’ve already gotten your binding machine and you’re just needing some tips for getting started, then keep reading. All comb, coil, and double loop wire binding machines have a built-in hole punch designed to correctly align the holes along the margin of your project with the binding materials that machine is designed for. When you’re punching your pages, it’s really important to make sure they’re correctly seated in the punch—pages should be set all the way into the punch as far as they’ll go, and you’ll want to do a visual check to make sure they’re straight so you don’t end up with holes going slantwise and off the page. While we’re on the subject of punching, keep in mind that each machine has a maximum number of pages it can punch at one time. This information can be found in your user manual and is different to each machine. The maximum punch capacity is based on 20lb uncoated bond, so if you’re punching heavier paper or acetate covers or anything else, you’ll need to adjust how many pages you punch at a time. Also, we strongly advise that you don’t regularly punch the maximum capacity of your machine as this can wear out the die faster, reducing the life of your binding machine. If you have ever wondered where the cut-outs (they’re called “chips,” by the way) go after you’ve punched your pages, check the “chip” tray—typically, it’s located directly under the paper punch (again, consult your user manual for exactly where this is located on your machine and how to access it). You’ll want to regularly empty this tray or else the chips can get jammed up between the die and cause them not to descend properly. If your machine has a margin adjuster, you can use it to help center your punches along the margin so you don’t have holes punching off the edges. Your machine may also have disengageable die which allows you to “turn off” some of the die so you can get your holes aligned correctly. If you need to, you can punch on scrap paper until you get things just right. 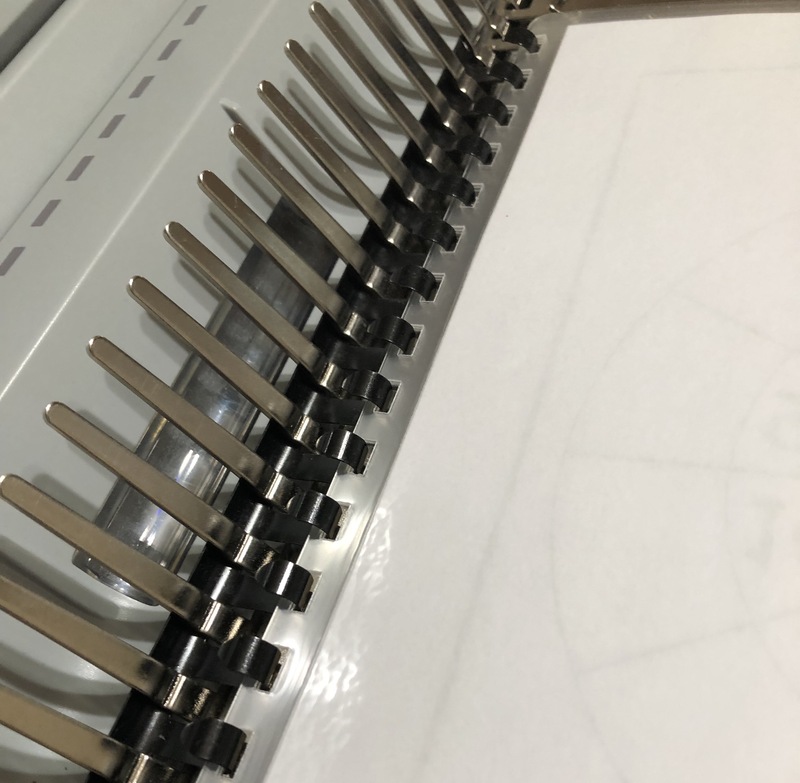 Along with an adjustable margin setter, your comb binding machine may also have an adjustable depth setting, which allows you to punch holes further away from or closer to the edge of your document. If you’re binding a thicker project, you’ll want to set your depth a little further from the margin of your page to give your document more durability. If you’re binding a thinner project, you’ll want to set your depth a bit closer to the edge of your margin to help your pages turn more smoothly. If you have trouble knowing what size combs to use for your project, check your binding machine for a sizing tool—many have them. Your user guide will give your information on exactly how to use the tool, but it’ll help you tailor your comb size to your document. Often the comb packaging will also have indications on how much paper that comb size can accommodate, so if your comb binding machine doesn’t have a sizing tool, check your comb packaging. And remember to move to the next size up if your project is nearing the maximum number of pages for the previous comb size. When you open your comb to slide your pages onto it, take care to open it just wide enough to accommodate your pages. Opening it too widely will give you less “tooth” space to fit your project onto, which will cost you time as you fiddle with things. Pages go onto both combs and double loop wire face down. You want to make sure you’re only inserting a few pages at a time; trying to slide too many on your comb will cause endless frustration as the teeth curl up between the stack of pages instead of slipping through the holes like they’re supposed to do. Larger combs often have divots on the two outermost teeth. These are designed to slide into a corresponding slot on the spine that help keep the combs closed even when loaded with pages. As with comb binding, if your coil binding machine allows you to adjust the punch depth, then use this feature to give your project optimal durability. Remember to punch further from the paper edge for thicker documents and closer to the paper edge for thinner documents. Also check for a adjustable margin settings so that your holes are centered along the project’s edge. If you aren’t sure about the correct settings, punch a few test sheets until you get it right. “Pitch” refers to how many holes your machine punches per inch. Most machines only come in one pitch, with 4:1 pitch being the most common, followed by 5:1 pitch. While pitch is something that you would’ve considered when first purchasing your coil binding machine, keep in mind the restraints of your machine, remember to punch within your machine’s pitch capabilities. Machines with a 5:1 pitch can handle projects up to 1″ thick, and machines with 4:1 pitch can handle documents up to 2″ thick. Speaking the slantis sleeve—if you’re binding large documents even semi-regularly, consider purchasing one. The slantis sleeve essentially curves your stack of paper so that your curved coils can be more easily inserted into the holes along the margin (otherwise, you’re inserting curved coils into a straight stack of paper, which is just as difficult as it sounds!). Once again, adjust your margin and depth settings as needed to give your project the best finish. Punch further from the page margin for thicker documents as this adds durability and closer to the margin for thinner documents so your pages turn smoothly. Adjust your side margins or disengage appropriate die to keep your punches centered on the page. And, as we said previously, if you need to test your settings, don’t be afraid to practice on some scrap pages. Pitch comes into play again with double loop wire binding—you can choose 3:1 pitch or 2:1 pitch (again, remember that pitch refers to how many holes per inch). As with coil binding, your machine will most likely only punch one pitch, so be aware of your double loop wire binding machine’s capabilities before you undertake your project. If your machine has disengageable die, they’ll come in handy with double loop wire. One of the beautiful things about double loop wire is its versatility. For instance, if you’re pairing a wire calendar hanger with double loop wire, you’ll need to disengage the middle two die as you won’t be using them. Use that feature. As often as necessary. When you’re inserting your pages onto the wire, flip the back cover over the front cover. After you’ve closed your wire, you can return the back cover to its correct position and your seam will be neatly hidden inside your document. Keep your wire snips handy. This can be used for shortening your wire if it’s too long, or snipping off sections of wire that are unused (again, remember that wire calendar hanger? You’ll need them for that!). We hope these tips will get you great results on each of your projects and, in the process, make your binding experience a little faster and a little easier. As always, for best results, remember to consult your individual machine’s user manual for features, settings, maintenance, and guidelines specific to it. A company-branded calendar is a great marketing tool! Hand it out to your customers and clients, and they’ll see your name on every day, every month, every year. It’s also a fantastic yet under-rated piece of swag for employees (pre-mark important days like paydays, company holidays, meetings, deadlines to make sure everyone’s on the same page). In this blog post, we’ll show you how to make your own calendar so you can put your company out front and showcase your brand with very little effort. Gather up your calendar pages—you’ll need one for each month of the year. Mark the center of the long edge of your pages where your binding will go on the finished project. Using your half-moon punch, punch out a divot right over the center mark on each page. Make sure you punch the front and back covers, too. This is where your calendar hanger will sit. If your binding machine has disengageable die, now is the time to use that feature by disengaging the middle two die where your divot was punched. Now slide the long edge of your calendar pages (where the binding will go) into your double loop wire binding machine and punch holes just as you would with any other document. Collate your pages. Once collated, flip the back cover the front cover (this will hide your seam inside the document, giving it a more professional finish). Place your wire into the wire holder on your machine per your user manual and slide your pages onto it face down. Get your wire calendar hanger and slide it into the center of your calendar above the divot that you punched in step 2. Close your wires using either a separate wire closer or the closer on your binding machine, if it has one. Grab your wire snips and cut the two wires in the center of your calendar where your half-moon is punched. Flip your back cover to the back again and pull your wire calendar hanger up. With just a few simple steps, you can create a beautiful, professional-looking calendar to distribute to your favorite clients, employees, or maybe your family and friends. Now, just stand back and admire your work. Pouch Laminating: Perfect Results Every Time! When you want to keep your menus clean, your posters reusable, your charts wipe-cleanable, and your documents durable, you laminate! If you’re like us, you’ll put your pouch laminator through its paces—you want it to last a long, loooong time, and you want to get the best possible results, every. single. time. Follow the tips below to keep your laminator running smoothly and your documents looking and feeling great! Is your menu coming out of the laminator all wrinkled up? Are there bubbles? Curled up corners? If so, you most likely have the temperature turned up too high for the pouches you’re working with. 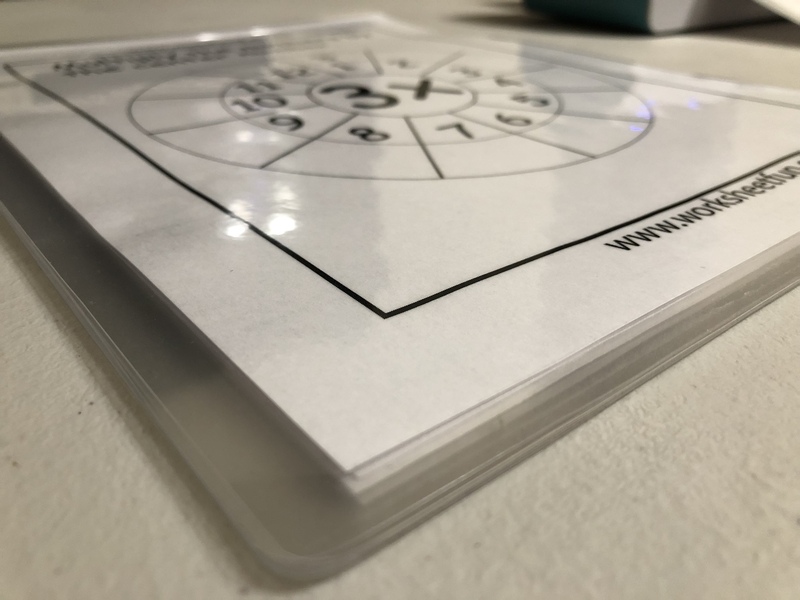 The user manual that came with your laminating machine will give you great information on the correct settings you need for the materials you’re working with so your documents come out flat, smooth, and perfect! On the other hand, if you run your wipe-off checklist through your pouch laminator and the pouch is cloudy, making it hard to see your list, then you probably need to turn your machine temperature up. Again, refer to your user manual for optimal temperatures needed to make your item come out crystal clear. Eventually, your pouch laminator will need to be cleaned; as you feed the pouches through, occasionally some of the film will adhere to the heated rollers, which can gum up your machine and cause your documents to come out with bumps and chunks. Your laminator’s user manual will have information about how and how often to clean your particular machine, but in general, you have a couple of cleaning options. You can run a sheet of 80# stock through the machine while it’s still hot to pull the gunk off the rollers. However, for best results, we recommend using a mildly abrasive cleaning pad (we like the 3M White Scotch Bride pad). Pour a little denatured alcohol on the pad or use a mild detergent to wipe the debris and melted film off the rollers. We also sell a pouch laminator cleaning kit if that’s more your style—again, refer to your user manual for cleaning tips specific to your laminating machine. Not everything you’re laminating is the exact same size, which makes it really important that you select pouches that are sized appropriately for your paper. The rule of thumb is to leave a 1/8” buffer on each side so the adhesive adheres well to itself and bonds to the paper properly. This will keep moisture and dirt clear of the paper you’re protecting, and will help prevent damage. 1. What am I going to do with my item once it’s laminated? Will it need to be folded or flexible? Will it be handled frequently? Will it only be used incidentally? For items that will be handled frequently (think menus), you’ll most likely want to use something on the thicker end of the scale: 7 mil or 10 mil. For something that will be used just incidentally, or that might need to be folded or scored, 3 mil or 5 mil might be more appropriate. 2. How thick is the item that I’m laminating? Generally, you would use a pouch that is roughly the same weight as the item that you’re laminating. So, for newspaper or regular 20lb bond paper, you’d use a 3 mil pouch. For 24lb bond paper, you’d use a 5 mil pouch. If you’re laminating card stock, you’d want to use a 7 mil pouch, while 10 mil would be appropriate for poster board. Keep in mind, as we discussed above, that the temperature of your laminating machine may need to be adjusted depending on what pouch weight you’re using. We hope this information will help you get perfect, polished results with your pouch laminator!